When William Dargan brought the railway to Bray, it opened up the coastal town to a boom in tourism, and modelling itself on Brighton and similar seaside towns in England that had grown and developed in late Georgian and Victorian eras, Bray saw the development of its seafront promenade, new suburban terraces were built, Turkish baths were opened, and new hotels were built throughout the town. Other Victorian additions included a new Church of Ireland parish church, new Presbyterian and Methodist churches, and the Carlisle Grounds, opened by Lord Carlisle in 1862 and now the home of Bray Wanderers. Bray began describing itself as ‘the Gateway to the Garden of Ireland,’ and the hotels benefitted from being beside the railway line and close to the seafront. William Dargan was responsible for bringing the railway to the town, and his vision is evident in the planning of the whole Quinsborough Road area. Quinsborough Road linked the old town with the railway station and the new tourist area close to the seafront. The International Hotel was built here, and Dargan’s associates included Edward Breslin, who opened the Royal Marine Hotel in 1859, John Quin of Quin’s Hotel, who owned most of the land in the area, and John Brennan, who built the International Hotel and many of the new terraces of Victorian houses. William Dargan acquired the site of the International Hotel and a terrace of houses on a 900-year lease from John Quin in 1860, with an annual rent of £50. John Brennan, who had made his fortune in America, returned to invest it in Bray. 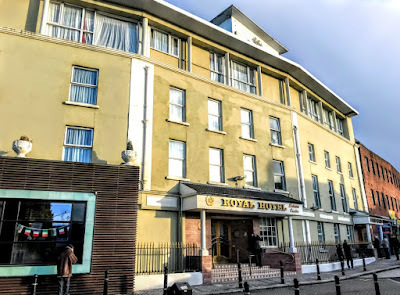 The new Victorian hotels in Bray included the Royal Marine Hotel, designed by George Wilkinson, the Esplanade Hotel built in 1860, the Strand Hotel which opened in a house once owned by Oscar Wilde, and the Bray Head Hotel, built in 1862. The International Hotel first opened its doors in 1862, and became one of Bray’s best-known landmarks. When my great-grandfather’s first cousin, Richard Lynders of Balcarrick, Donabate, and his wife Harriet (née Egan) spent their honeymoon in Lacy’s Bray Head Hotel in February 1891. Earlier this week, I have also written about how my cousins in the McSwiney family ran a small hotel at Tullira on the seafront in the mid-20th century. But the oldest hotel in Bray is the Royal Hotel on Main Street, fronting a tiny square that links Quinsborough Road and Seapoint Road, where the shell of Bray’s original town hall still stands. There has been an hotel on the site of the Royal Hotel since 1776. The first hotel on the site was owned by John Quin senior, and by 1788 it was known as the Meath Arms Hotel. The Meath Arms was probably named after the Brabazon family of Kilruddery House, who were the principal landlords in the Bray area from 1666, and they held the title of Earl of Meath since 1627. When John Quin died, the hotel was inherited by his eldest son, William, and then by William’s brother, also John Quin, who expanded the hotel and made it a posting hotel, where stage coaches called up to six times a day. In 1800, the hotel was known as Quin’s Hotel. The hotel was transferred from John Quin senior to John Quin junior with a considerable portion of land in Bray, in 1821, and King George IV is said to have visited the hotel in 1821 during his visit to Ireland. By the mid-19th century, Quin’s Hotel had an impressive reputation, and notable visitors and guests included Percy Bysshe Shelley, William Makepeace Thackeray, Charles Dickens and Sir Arthur Conan Doyle. During his visit to Bray, Dickens may have heard of Augusta Magan, who lived at Corke Lodge in Shankill. Her eccentricities and reclusive life are said to have inspired his creation of Miss Haversham, in Great Expectations. The hotel was mentioned positively in all the tour guides of the day, offering 60 bedrooms, livery stables, good food and wines, and ‘baths, fresh and salt, hot and cold, with shower, ditto, always ready.’ Quin’s Hotel was then one of the most highly-priced in Ireland, and the clientele included at least one Lord Lieutenant of Ireland, Thomas Philip de Grey (1781-1859), 2nd Earl de Grey, who stayed there several times, including a visit for his ‘flying gout’ in 1842. When Daniel O’Connell stopped in Bray on his way from Dublin to Wexford on 22 July 1845, a huge crowd gathered in the streets to welcome him. He was met by the local clergy and he joined them for a public breakfast in Quin’s Hotel before leaving Bray later that morning to continue on his way to Wexford. By the 1830s, the Quin family had laid out a walkway from their hotel to the beach. Quin’s Walk lay along the present roadway in front of Duncairn Terrace. John Quin, the third generation in the family business, inherited the Quin Hotel and lands in 1852. The White Lion, one of the oldest inns on the town’s main street, was demolished as the hotel was extended and Quinsborough Road was laid out parallel to Quin’s Walk in 1854, when the railway station opened in Bray. Initially, Quinsborough Road was known as Railway Road, but the new name reflected the importance of the Quin family in the local economy, and it became the main artery linking the old town clustered around Main Street and the new resort town developing along the sea front. John Quin lived at Galtrim House off Seapoint Road. Today, Galtrim Park is tucked away between Quinsborough Road and Seapoint Road. From 1860, Quin’s Hotel was known briefly as the Bray Hotel. John Quin rebuilt the hotel on the corner of Quinsborough Road, curving it elegantly around into the new street and from 1867 it was known as the Royal Hotel. But, despite its earlier elegant reputation and its once virtual monopoly, could not compensate for its distance from the seafront. The hotel changed hands several times, and the proprietors included the Hayes family, who also owned the Royal Marine Hotel in Dun Laoghaire, the Jesson family, who also owned the Grand Hotel in Malahide, and the Mulliott family, who also owned an hotel in Suffolk Street, Dublin. Adam Seaton Findlater (1855-1911), a member of the Findlater family who owned well-known food shops in Dublin, also owned the Royal Hotel for a five-year period. His other hotel interests included the St Lawrence Hotel and Royal Hotel in Howth. The Royal Hotel in Bray was redesigned by his father-in-law the architect John McCurdy (1824-1884), who had redesigned the Shelbourne Hotel on Saint Stephen’s Green, Dublin, and designed the Royal Marine Hotel, Dun Laoghaire, Saint Helen’s, Stillorgan, and All Saints’ Church, Carysfort Avenue, Blackrock. In the 20th century, the stars who visited the hotel included Stan Laurel (of Laurel and Hardy), James Cagney. It was a style for cinemas made popular by the Louxor Palais du Cinema in Paris, which was once one of the jewels of Egyptian-inspired art deco. It opened in 1921, boasting pillars, papyrus motifs and pharaohs’ heads – and with an auditorium that could seat almost 1,200 people. Similar ‘neo- Egyptian’ style cinemas of this era included the former Regal Cinema in Lichfield, which opened in 1932. The Royal Cinema in Bray ran from 1935 until it closed around 1974. Later, it was Bray Cineplex in the 1990s until it closed in 2007, and for some years after it was a bingo hall. In 1937, McPhillips and McGurk bought the Royal Hotel and it was extensively refurbished by Vincent Kelly before reopening. Three years later, when Bill Cavey bought the Royal Hotel in 1940, it had only 12 bedrooms. Over the years, he extended his hotel several times, eventually having a rooftop restaurant with a separate breakfast room, ground floor restaurants and bars, 160 rooms and two elevators to all floors. Bill Cavey copied the sign at the Stardust Hotel in Las Vegas with his version in Bray. He named the restaurant and function room at roof-top level the Starlight Room, and the Royal Hotel became the Royal Starlight Hotel. During this time, the Ardmore Film Studios opened in Bray, and the stars who stayed at or visited the hotel included George Peppard, Peggy Cummins, Terence Morgan, Aldo Ray, Peter O’Toole and Katherine Hepburn. In January 1970, when the South African Springbox team played an 8-8 draw against Ireland at Lansdowne Road, they stayed at the Royal Starlight Hotel in Bray, and there were strong protests outside the stadium, at the hotel and in Dublin city centre. The Springbox had to stay in the Royal Starlight in Bray which was then a non-union hotel, because the trade unions were boycotting their visit. The Post Office Officials cut off phone contact to the hotel. About 6,000 people marched that the day in a protest against the match organised by the Irish Anti-Apartheid Movement. The Royal Starlight Hotel fell on hard times in 1973 due to a downturn in tourism brought about by the violence in Northern Ireland. The hotel was sold in 1975, and later returned to using the name of the Royal Hotel. The Royal Hotel has outlived many of the Victorian competitors that once threatened its survival, pre-eminent again as it was almost 250 years ago. 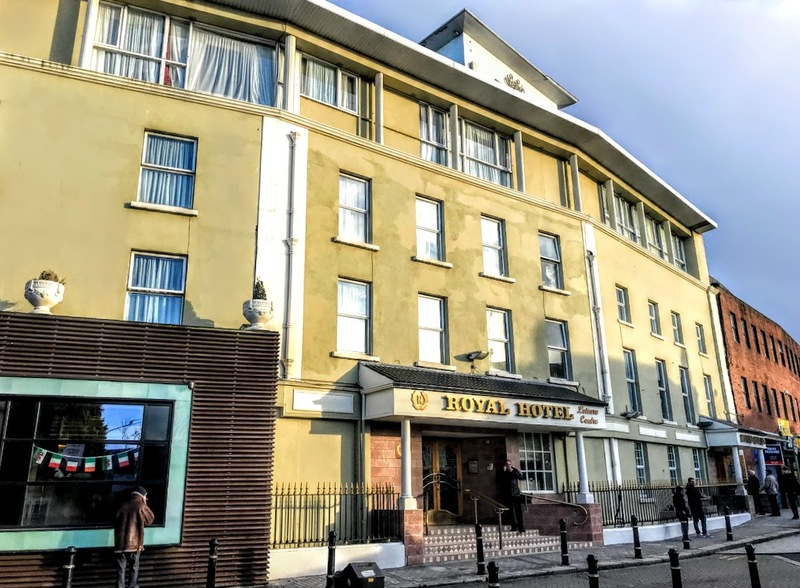 Today, the Royal Hotel is a three-star hotel in the centre of Bray, with 125 en-suite bedrooms, two conference rooms, three boardrooms and a ballroom, Quin’s Bar, McGettigan’s Bar and the Merrill Leisure Club and Spa, with a fully-equipped gym and swimming pool. We have come to the half-way mark in our Lenten journey. As part of my meditations and reflections in Lent this year, I am being guided by the Stations of the Cross from three locations. In the seventh station by Liam Cosgrave in Millstreet, Christ stumbles and falls to his knees, despite the best efforts of Simon of Cyrene to help him bear this burden. We are half-way through the Stations of the Cross, but there is no light touch or easy way out. Tomorrow: Station 8: Jesus meets the Holy Women.